Welcome to Part 1 of our series that recognizes our 2018 Retailers of the Year. In this post we honor Applejack Wine & Spirits of Denver, Fisher’s Liquor Barn of Grand Junction, and Liquor Factory of New Jersey. Keep an eye out for future parts that will post in the coming weeks. The single-location outpost is 45,000 square feet and was founded in 1961. 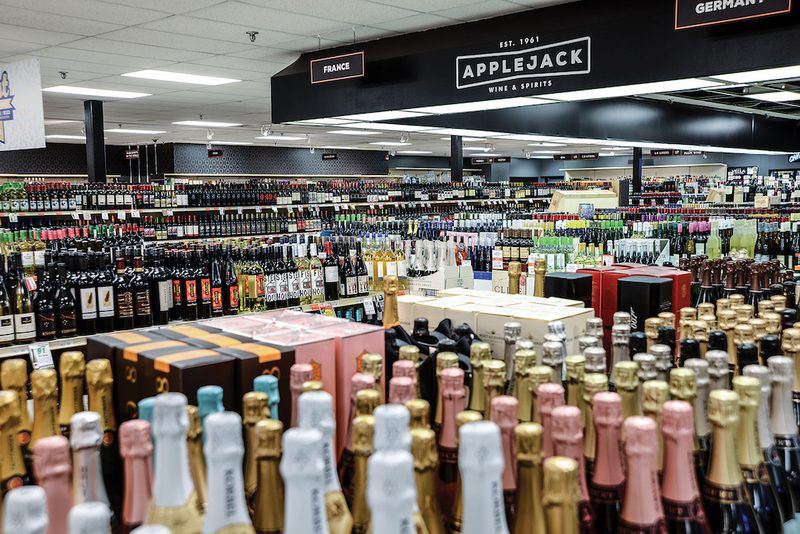 As Denver experiences a major population and growth boom, it’s good to be Applejack Wine & Spirits, the 50-plus-year-old retailer located in nearby Wheat Ridge. Though it is ever evolving, Applejack continues to be a destination that carries special significance to customers new and old, says general manager Elizabeth Gregg. Census Bureau data ranks Denver 11th on the list of U.S. cities with the greatest addition of residents. In the last year, Gregg says, the store embarked on a push to create a more comprehensive brand experience, overhauling and updating its logo, as well as the look and feel within the store. New fixtures are made with wine boxes from France, and Gregg says she hopes new lighting and flooring will be installed this year. The single-location outpost is 45,000 square feet and was founded in 1961 by Alan Fries. Honoring Fries’ legacy of outstanding customer care, Gregg says Applejack of late is “really working on the people piece of the business”—but it’s been challenging. This year, Applejack also launched a new loyalty program—currently 50,000 members strong—that offers special pricing for members. It primarily advertises on radio and billboards, and does a little social media or direct mail—but has gained traction with social media boosted posts and consumer giveaways. Applejack’s email marketing database has some 70,000 people and runs on a defined schedule and product strategy to drive repeat purchases. Applejack also has a strong community presence, having supported over 60 local non-profit organizations in in the past year alone, including University of Colorado Anschutz Medical Campus, Jeffco Public Schools, Jefferson Center of Mental Health and Wheat Ridge Community Foundation.